Create a tranquil sanctuary in your garden with the Dura-Trel Providence Arbor. Simple latticework on each side panel leads to a dramatic, flat top. Overhanging vertical rails along the top of the item offer a striking contrast, for added effect. Additional diagonal supports in each corner bring movement, and help keep the top of the arbor stable. 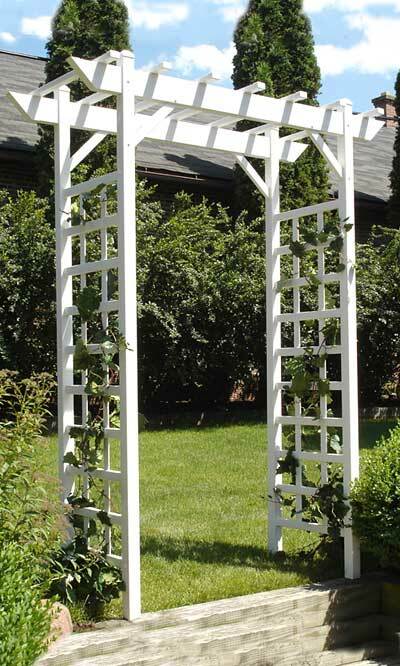 Plant vines or climbing flowers around each side of this arbor, and help them weave in and out of the grid as they grow, for interesting and personal patterns in your lawn. The white color adds a dramatic contrast to your foliage, while the vinyl construction offers years of service. This arbor is constructed with the highest quality vinyl, containing the greatest concentration of titanium dioxide available. This compound acts as a powerful ultraviolet stabilizer, protecting the vinyl from the rays of the sun. The arbor will never fade, crack, peel, or rot, and its white color will remain vibrant for years to come. Use the included ground anchors to place this item solidly on the ground. Bring a divine feel to your lawn with this Providence Arbor. Assembly required. Made in the USA. Twenty year guarantee. Availability: 26 in Stock. Ships from OH within 24 business hours , 26 available at this price!